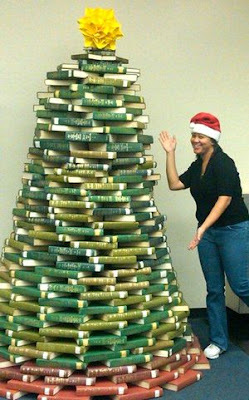 This Christmas tree made from books takes a bit more effort, compared to the one from a few days ago, and a little taste for book destruction. Juniper Books found themselves with a surplus of green fabric-bound books, whose contents had been digitized and thus the paper was headed for the dumpster anyhow, and decided to make a Christmas tree. The edges of some books went into the bandsaw to make the traditional arrow-point branches, while the rest make up the body of the tree. Via Juxtapoz. 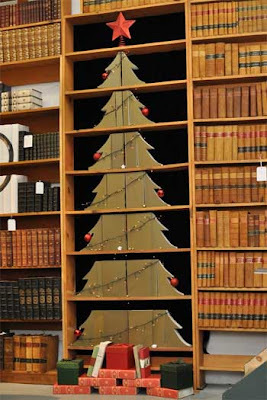 Oh, the weather outside is frightful, but the fire is so delightful, and as long as you've got a nice bunch of books that you're ready to stack, you can make yourself a book Christmas tree! I found out about this fun craftiness only minutes before leaving the house to go buy a real Christmas tree, and just for a few moments I considered unloading the bookshelves…but then I gave it some thought, and I figured I'd be happier vacuuming up needles than having to reshelve everything before New Year's.